I’ve grown to love July 14th, Bastille Day, as it is such a magical night at Chez Panisse Restaurant. 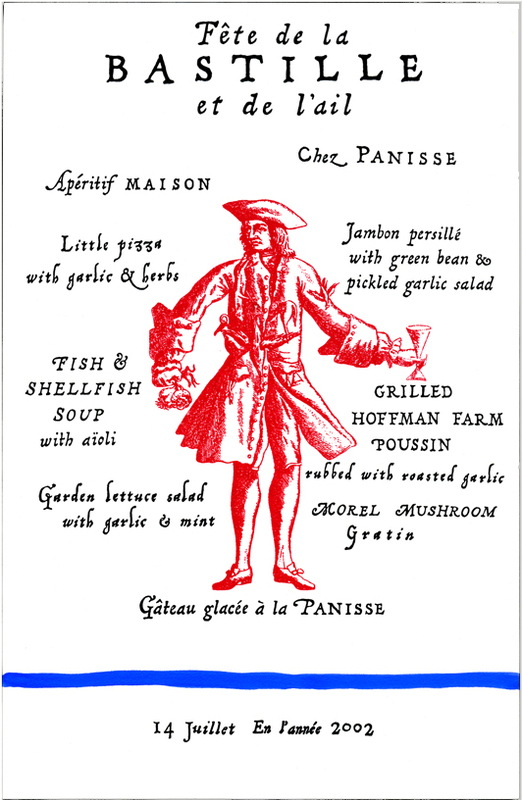 Over the years I have created many Bastille Day menus for Chez Panisse, the above 2002 menu was my first. At Chez Panisse, Bastille Day is also a celebration of the garlic harvest. The decorations that can be found all around the restaurant are breathtaking… beautiful garlic garlands, olive branches, and French flag ribbons as far as the eye can see! The menu items are absolutely delicious and celebrate traditional rustic French fare, and lots of garlic! I feel nostalgic looking back at my design from 9 years ago. It’s simple execution still holds strong. 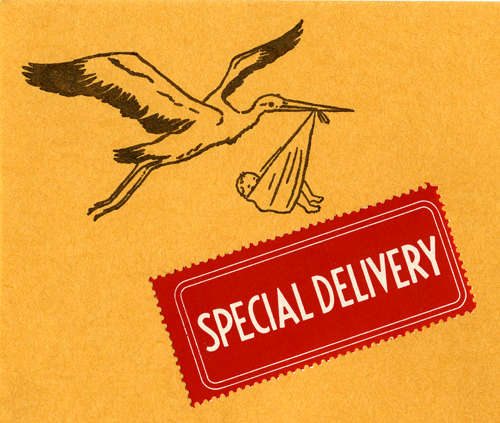 Pizzaiolo Restaurant just had it’s sixth year anniversary! 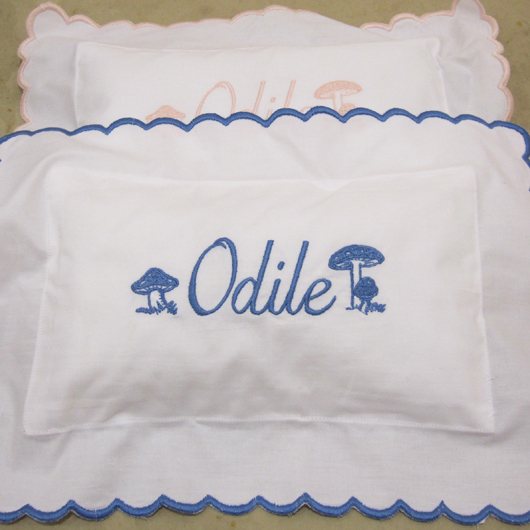 I have worked with Charlie, the owner, quite a bit on various projects. My favorite projects being the commemorative Anniversary Posters! Sadly, I did not create this year’s poster due to my crazy schedule and timing. But I thought it was timely to share the poster I designed for last year’s 5th anniversary. Please forgive the slightly warped image, this is a photograph of the poster on a stainless steel refrigerator in my kitchen. 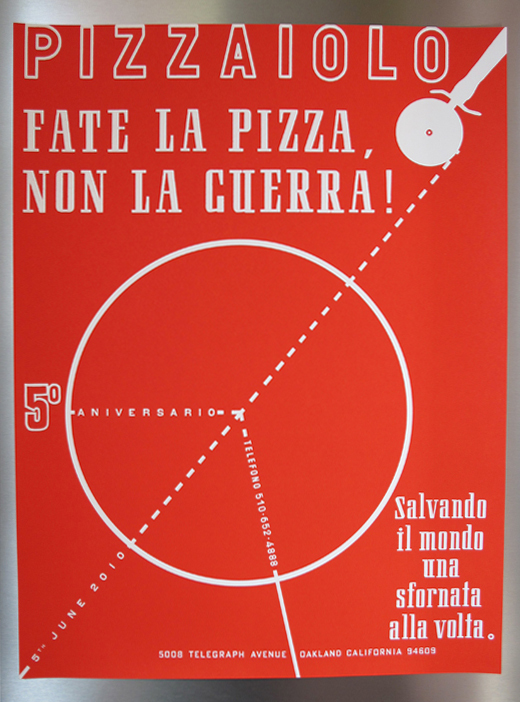 The Italian title translates to “Make Pizza, Not War!” and the tagline roughly translates to “Solving problems, one pie at a time” with subtle references to “manual labor” and “unloading ovens” as well. I love the bold simplicity of the image and how the pizza cutter cuts a diagonal line across the page to create a peace sign… and a pizza! Charlie wanted the “Pizzaiolo” to bleed off the top of the page, which I thought was a great suggestion. The posters were silkscreen printed by an incredible local artist, Natt Swope of Bloom Press. The gorgeous quality of silkscreen ink and vibrancy of the warm red really made the poster very special. Natt is a dream to work and I was so excited to get the opportunity. Here is an alternate menu header that I designed, using beautiful hand-set type. I love the dimension of the 2-color “Pizzaiolo”. I sure hope I get to collaborate on Year 7! I’ve been reorganizing my studio lately and sorting through drawers and drawers of my lateral files. 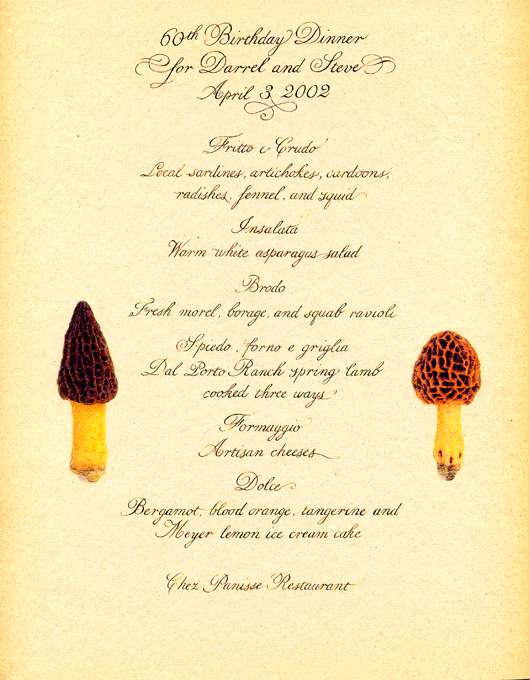 I came across this menu that I created for a special birthday dinner at Chez Panisse Restaurant. 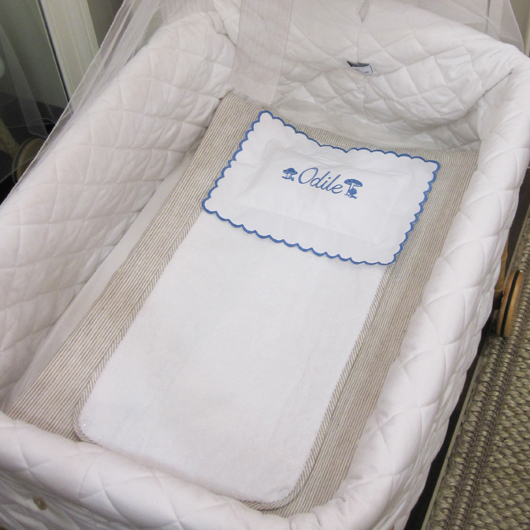 A 60th birthday celebration for two of Alice’s close friends. I love the charming, funny little morel mushrooms, photographs from one of Alice’s books. 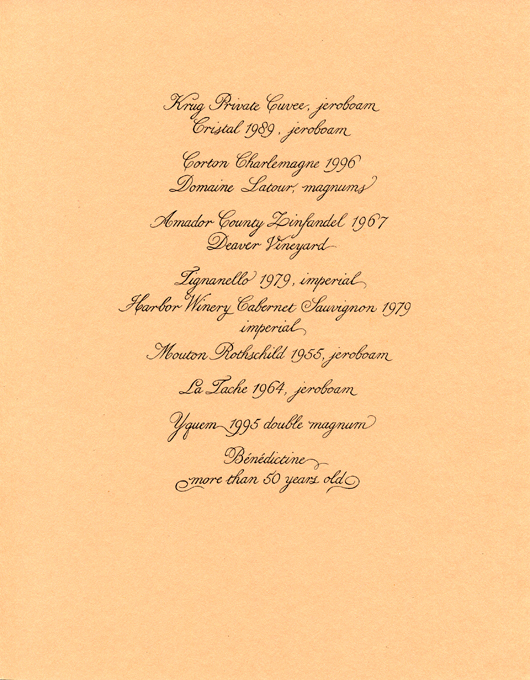 Here is the back of the menu, a long and impressive list of the wines and liqueur that were served that evening. I like the simple elegance of the calligraphy style I chose to work in. Sometimes the most simple design can be so pleasing. 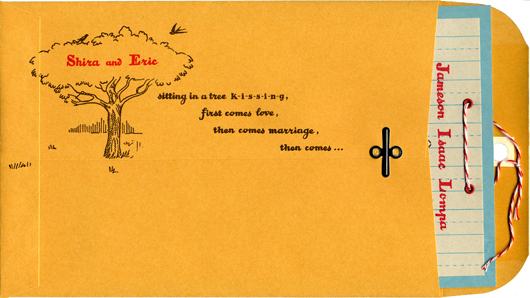 That’s the way I feel about this wedding invitation that I created for my friends Mark & Melissa. 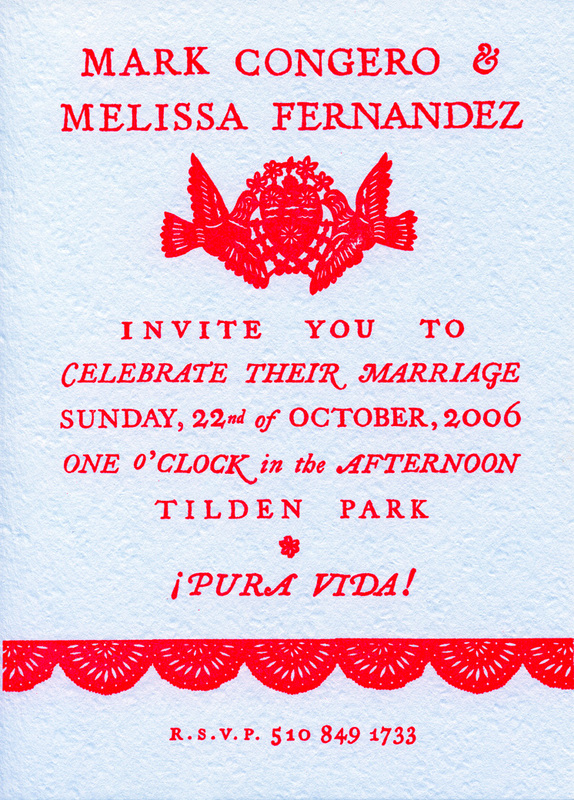 They chose a beautiful pale blue paper and we silkscreen printed it together in hot red ink. I hand-lettered the text and created the silhouettes using reference from traditional papel picados. Their wedding celebration was just as simple… and just as wonderful. a taco truck serving delicious food and live Flamenco music! Now that’s what I call a perfect way to celebrate! I was looking through my archives and came across this very special memorial card. The daughters provided the tender Walt Whitman poem about lilacs… Margaret’s favorite. 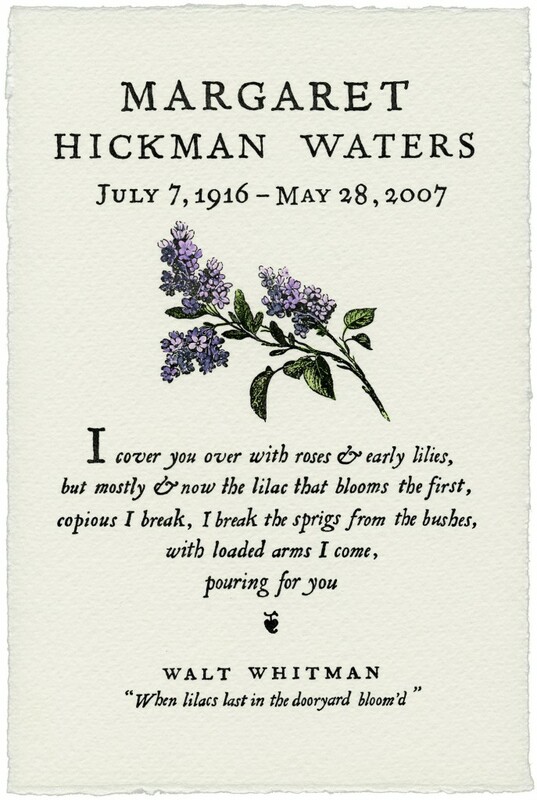 I hand-lettered the poem and added a beautiful botanical engraving of lilacs. 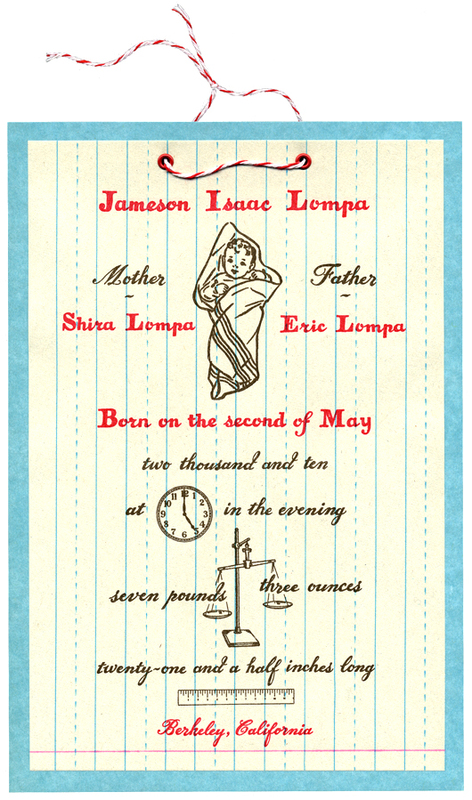 After I letterpress printed & delivered the cards the siblings gathered around their table and hand-painted each one while telling stories… and remembering their mother.